This strange mixture between telephone and computer is actually a Sinclair QL (slightly modified, of course). It is based on the QL motherboard, but with some improvements, namely, ruggedized (in other words, more reliable) Microdrives. ICL also added some software in ROM: diary, address and phone book, communication software and a terminal emulator. It has a built-in modem and a speech synthesizer. According to ICL, each executive should have this computer on his desktop ! Two rebadged versions were sold in UK (Merlin Tonto) and Australia (Telecom Computerphone). The main software was Psion xChange - WP, spreadsheet, DB and business graphics. This was in ROM, with the BASIC interpreter on Microdrive - Sinclair QLs were the other way round. xChange was a good package for its day, and actually looks very similar to the built-in packages on the Psion PDAs (3a, 5). 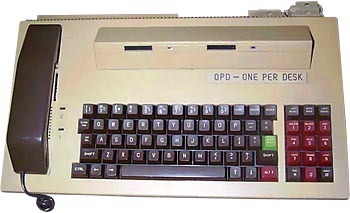 The terminal emulation was a VT-type and a PRESTEL (the UK info service operated by the post office). Add-on ROMS were available (your pic actually shows one top right) which made the machine into an ICL7561 terminal emulator. This was a popular configuration as ICL discounted them heavily and they ended up cheaper than the original terminals. see more ICL OPD - One Per Desk Ebay auctions !